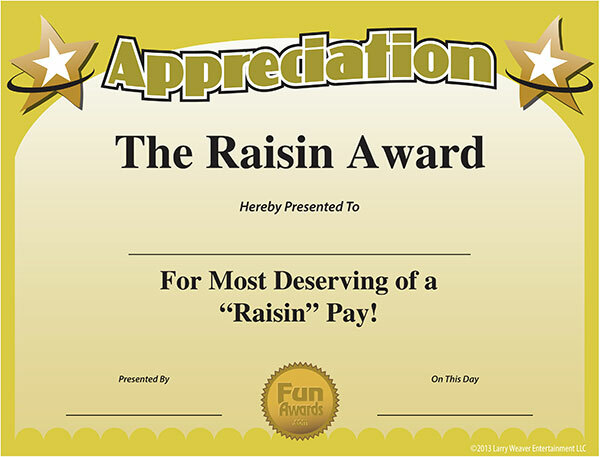 Find free printable certificates of appreciation samples, templates and examples at FunAwards. Plus blank certificate of appreciation templates to make your own appreciation certificates. Within every workplace, office or organization, there's always at least one employee, volunteer, or staff member who really deserves a raise in pay -- or maybe they just think they do. 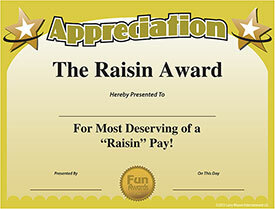 Show them you care without spending a dime with this free certificate of appreciation. Each collection comes with blank certificate of appreciation template in PDF format so you can add custom wording to make your own appreciation certificates. If you need volunteer appreciation certificates or staff appreciation certificates, take a look at either collection. They both have dozens of silly and humorous gag certificates applicable to any organization or gender.